As soon as I hear Maldives I imagine blue water , white stands , beautiful resorts on private islands and models emerging out of the sea in a bikini. Yes, all these years Maldives have been able to establish itself as the perfect holiday destination where one can get indulged in the best luxuries that life has to offer.Maldives is the perfect destination where you can indulge in water sports , diving , lazying on the sea beach on a hammock while sipping your favorite wine , lip smacking food and once in a life time experience fly the sea plane. Holidaying is Maldives is not cheap and many people just can't imagine going to Maldives due to cost factor. You search for any good place to stay in Maldives you will be surprised to see the rates per night upwards $200 and that's just the accommodation. Add other costs like transportation , food , water sports you could easily be spending more than $1000 per person in just five days. Don't worry at shoestring travel we believe in gaining lifetime experience at a budget. Travelling to Maldives is very much possible on a Budget these days. One word of caution : You need to plan your entire trip meticulously while travelling to Maldives or else you might risk to spoil your entire vacation. 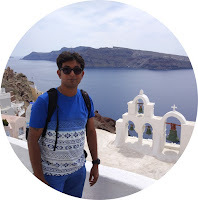 In this blog post I will let you know the things you need to keep in mind while planning the perfect vacation to Maldives. 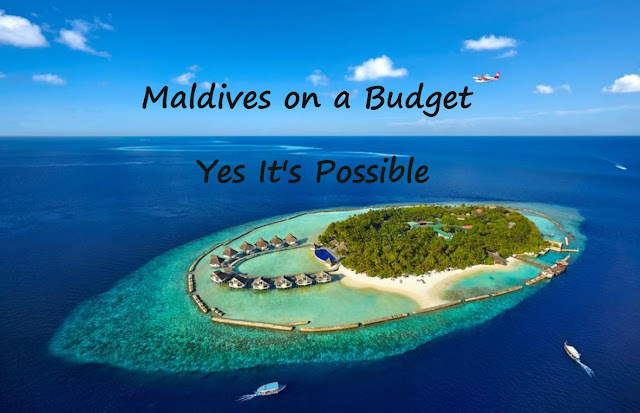 So Why planning a Holiday on Budget in Maldives is complicated ? I don't want to scare you while you are planning the perfect vacation , however I want you to know everything before you embark on your vacation to Maldives so that it becomes a memorable experience. The locals were not allowed to open guesthouses at their own place till 2009 hence all the good staying options are high cost private islands options , through this is changing in recent times. The resorts and hotels will add approx 23% as legitimate government taxes on the price that you will see on the menu. As I mentioned earlier planning a trip to Maldives is different than any other country in the world. Flight : Its cheaper to fly to Maldives from Bangkok/Sri Lanka than any other place. So while booking a flight to Maldives try to include stay at Bangkok/SriLanka/Malaysia/India, that ways you can enjoy the places before embarking on an exotic journey to Maldives. Want to know how to book cheap flight tickets to Maldives, read by blogpost on "10 Secrets to Book Cheapest Flight Ticket"
Bikini : If you are excited to click amazing pictures of urself just like you see on many swimsuit calendars , then hold on to the excitement for time being.Maldives in a muslim country hence wearing bikini is not allowed on the public beaches. 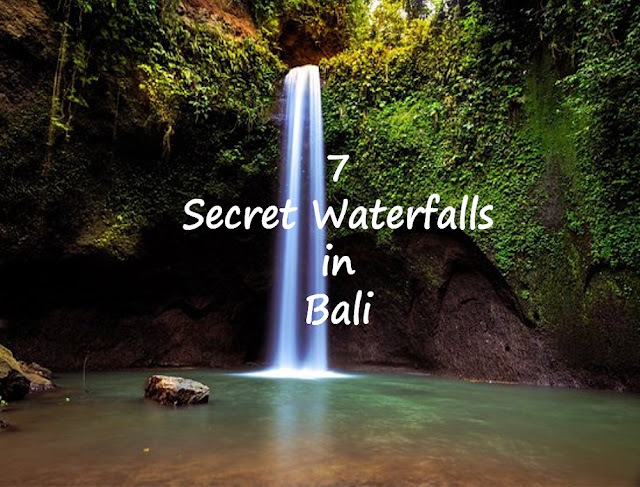 In few public beaches there are designated areas called as "Bikini Beaches" where you can wear bikini.If you are staying in a private island resort then you needn't worry. Resort or Hotel Location : This is one of the most important factor while booking your resort or hotel. Remember Maldives is a country with small islands so enquire how far is the location of the resort from the capital Male. You also need to ask the hotel/resort how you will travel from Male to the location. Kindly note for most of the island resort either you have to hire a speed boat or a sea plane to reach there. This will add up to your cost. The cost of speed boat will be $100+ whereas for sea plane it would be $200+. In few resort you have to book the speed boat/sea plane from them or else you can't reach there. If this is the case my suggestion is refrain from booking the place as they will charge you more than the prevailing prices. Alcohol: In Maldives alcoholic drinks are not easily found as its a muslim country and its banned for local population. You can only find in restaurants or hotels. You will not find drinks in normal convenience store so be ready to become James Bond if you want to buy drinks from outside. Resorts/Restaurants have a steep markup for alcohol. You can't enter Maldives with alcohol as the same will get confisticated at the airport. When to Visit : If you plan to visit maldives on a budget then go between April - September. This is the off peak season and the rates are generally lower than the peak season between October - March. Prices start to rise from October and is highest between Dec to February. Time of Reaching at Male : Don't reach Maldives on Friday as you will be stranded in Male for the entire day. Ferries are not available on Friday. Also remember if you reach Maldives in the afternoon or evening you have to stay in one of the local island as ferries for the day might not be available. Check the local ferry schedule on AtollTransfers . The local ferries are very cheap so you don't have to worry about your budget. 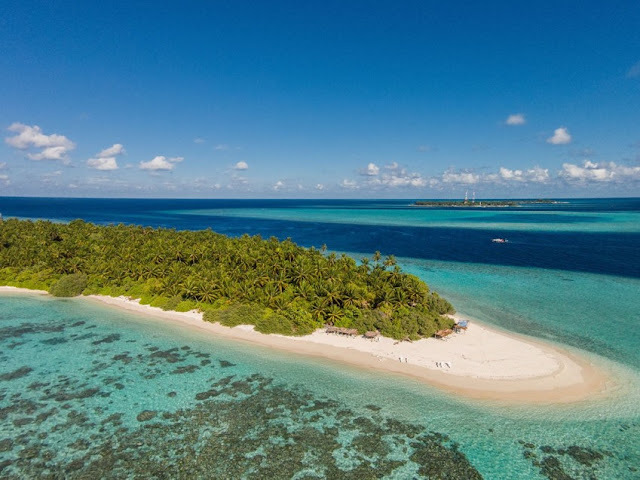 Day Outing in Island Resort : If you want to enjoy the resort life then there are many day outings available at the island resorts where you can spend an entire day and use all the facilities. The day outing starts at around 8am and ends at around 5-6pm. The transfers are also included in the package. Half of your planning is done if you can find a nice beach side staying option in Maldives at a budget. Imagine the happiness of waking up in the morning to the views of turquoise blue water and white sand. Its indeed splendid. To get such experiences in life on a budget a whole lot of planning is required. So how can you find a cheap and beautiful accommodation in Maldives while travelling on a shoestring budget. Remember earlier I mentioned that since 2009 locals are allowed to open guesthouses in inhabited islands.To understand which islands are the best to stay its important to understand Maldives as country. 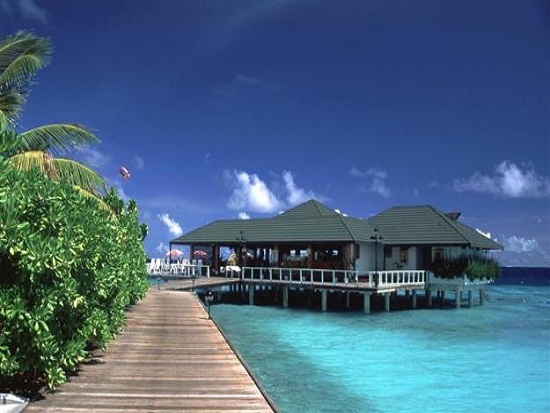 Maldives is a country which has many small islands and few are inhabited by locals , few converted in island resorts. Every island has its own beauty. Below are the islands where staying options are available on a budget.The best way to decide on which island to stay is finding the ferry options from Male, the capital of Maldives. a) Male : It is the capital of Maldives and a bit densely populated compared to other islands.Its not recommended to stay here unless you have a flight or ferry to take the next day. You will not be able to enjoy the real Maldives if you are planning to book a room at Male. I recommend to check the other island options. b) Maafushi : This is a small island and you can cover the entire island in 20-25mins. You will find lots of guesthouses starting $30+ ( during off season) & $50 + ( during peak season) per night with spacious rooms , air conditioning , free wifi etc. The island is easily accessible from Male and takes only 1.5hrs on a local ferry from Male. 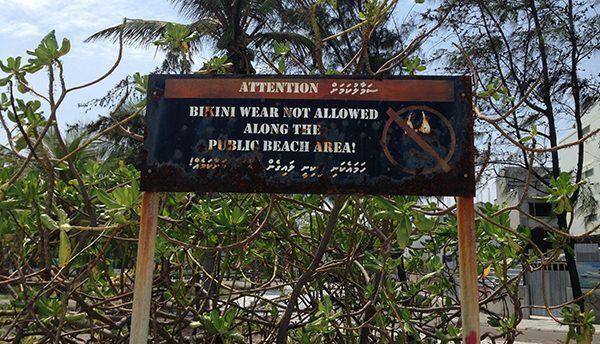 The best part is that this island has a beautiful public Bikini beach. So you can enjoy the beaches on a budget. You can do snorkelling here but the corals are not great here during to heavy commercialization. d) Hulhumale : It is an artificial island which was made to accommodate the increasing population of Male. The island is nothing great to talk about but you can find many guesthouses here. 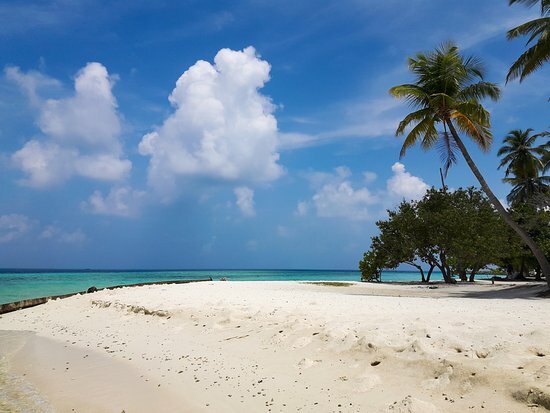 e) Thinadhoo : This is one of the best local island easily comparable to Fulidhoo. The beach is lovely,you can find beautiful corals here. There is also a dive shop. It takes around 5.5 hrs from Male by local ferry. My personal recommendation is this island. f) Keyodhoo : Another beautiful island where you can stay for a day and enjoy the pristine beaches and do some snorkelling. g) Gulhi : Gulhi is quiet and hardly any tourists go there.The water here is perhaps even more impressive than Maafushi, but there just aren’t any facilities here for tourists. Gulhi Beach Villa (owned and operated by a Singaporean/Chinese couple) does have beach chairs for guests, but no one else does. In fact, there are only 3 choices for accommodation on the whole island meaning your choices are limited. You can use Booking.com or use AirBnB to choose your options of stay. You should book guesthouses in advance in the smaller islands as the options are limited in these island. 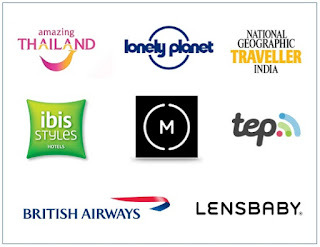 Another website which gives good options for Guest Houses in Maldives is Guesthouses in Maldives. Check out for deals on this website. A week in Maldives is good enough if you want to enjoy the islands. Instead of staying at a single island my suggestion is to hop around the islands and enjoy the various sights the various islands have to offer. 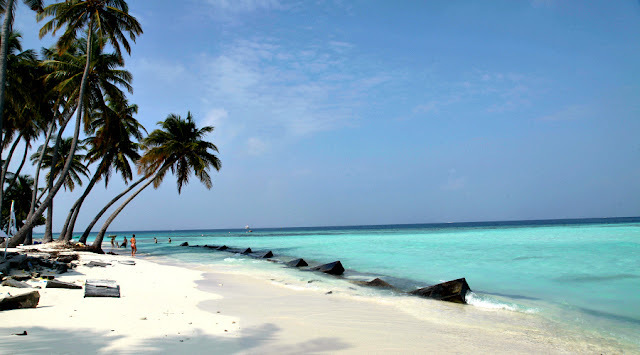 So enjoy your dream vacation to Maldives on a Budget and don't forget to share your experiences with shoestringtravel.